In today's media landscape, a trade rumor may have a longer lifespan than the news of an actual trade. Teams are rumored to be keeping an eye on a player. Then, they're circling. Next, they're getting close. This can all take days or even weeks, depending on the size of the star being dealt. Finally, the deal is done. Everyone analyzes it for a day and moves lickety-split to the next big rumor. But the impact of a trade has a much longer shelf life, especially when a deal is heavy with prospects. It's true that trades should be analyzed based on the respective value of each package at the time. However, trades aren't frozen in amber. Players change for better or worse in new organizations and situations, making it a worthwhile exercise to look at deals in the light of new information. In that spirit, Toolshed reviews some of the major trades made in the month before the 2017 deadline to see how they look based on how prospects have performed since that time. 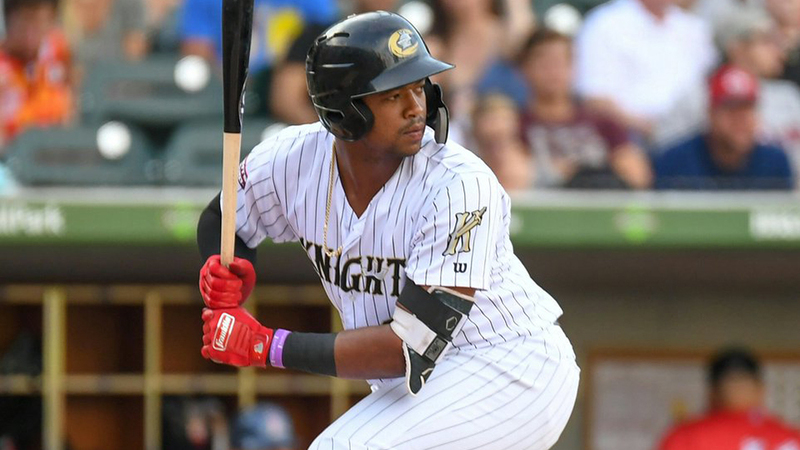 Jose Quintana (Cubs) for Eloy Jimenez, Dylan Cease, Bryant Flete, Matt Rose (White Sox): This trade beat the deadline by a good 18 days, and there wasn't one that topped it in terms of prospect return. The big draw for the Cubs was adding Quintana to their rotation through 2020, but they paid through the nose and that hasn't changed in the last 12 months. Jimenez has only solidified himself as one of the game's top five overall prospects by pairing a good hit tool with one of the Minors' best power tools, and he's only one level away from the South Side, at Triple-A Charlotte. Cease, who has Tommy John surgery and control problems on his resume, has already matched his career high for innings at 93 1/3 and continues to show the elite velocity that helped him reach Double-A Birmingham in mid-June. Even if Flete and Rose still only look like fillers, the loss of Jimenez and Cease could prove costly, especially if Quintana can't help push the Cubs back to the promised land as he looks like more of a No. 3 or 4 starter these days than a No. 2. Sonny Gray (Yankees) for Dustin Fowler, Jorge Mateo, James Kaprielian (A's): This was supposed to be the other big blockbuster of the month, but it's felt like anything but since. The A's took on a lot of risk but also a lot of raw talent in Fowler, Mateo and Kaprielian, and that risk hasn't paid dividends yet. Fowler, who was still recovering from a knee injury at the time of the trade, has been a below-replacement-level player in the Majors this season. Mateo continues to flash some of the game's best wheels, but his bat has gone silent with a 57 wRC+ at Triple-A Nashville. Kaprielian still hasn't pitched in a game after undergoing Tommy John surgery in April 2017, experiencing shoulder issues earlier this year. Not that the Yankees can boast about what they got, either. Gray has been the Yankees' worst starting pitcher this season with a 5.34 ERA, and rumors are popping up that New York would listen to trade offers for him, despite the fact that he still has another year of team control after this one. For the A's, there's still hope that Fowler and Mateo can turn things around and Kaprielian can someday get healthy. Sean Doolittle, Ryan Madson (Nationals) for Jesus Luzardo, Blake Treinen, Sheldon Neuse (A's): This is still a fun one a year later. Washington's biggest need this time last year was in the bullpen, and it paid dearly to add a pair of established relievers 15 days before the deadline. For the most part, it worked. Doolittle and Madson shored up the Nats relief ranks, and though Madson is in the midst of a down year, Doolittle was a National League All-Star this month, thanks to his 1.45 ERA and 22 saves. That said, Treinen has posted a 1.53 ERA, collected 37 saves and has become an American League All-Star himself since the deal, and he alone is looking like a more valuable asset than the 37-year-old Madson. It gets even more interesting when considering Luzardo is in the mix. At the time of the trade, the 2016 third-rounder had made only three starts in the Gulf Coast League as he recovered from 2016 Tommy John surgery. Now, he's arguably the game's top left-handed pitching prospect and has already climbed to Double-A at age 20, thanks to a plus fastball and impressive changeup. He demonstrated both of those offerings at the Futures Game as the World team starting pitcher at, of course, Nationals Park. Todd Frazier, Tommy Kahnle, David Robertson (Yankees) for Tyler Clippard, Blake Rutherford, Tito Polo, Ian Clarkin (White Sox): Frazier, a two-time All-Star who hit at least 35 homers in 2015 and 2016, looked like the headliner as a rental here, but many contended that adding controllable bullpen arms Robertson and Kahnle was the bigger get for the Yankees. As things stand, only Robertson is left in Major League pinstripes. Frazier signed with the Mets in the offseason, and Kahnle, who had shoulder issues back in April, has been in Triple-A Scranton/Wilkes-Barre for most of the season. The value of the White Sox return depends mostly on Rutherford, as it always did. Chicago bought low on the 2016 first-rounder, and he's only helped his stock by hitting .305/.353/.454 with six homers and 13 steals at Class A Advanced Winston-Salem. Rutherford isn't the five-tool threat the Yankees hoped they were getting at No. 18 overall, but he's shown noticeable improvements at the plate, making him very much a factor in the long-term White Sox rebuild. Justin Wilson, Alex Avila (Cubs) for Jeimer Candelario, Isaac Paredes (Tigers): Candelario, ranked as the top prospect in the Cubs system at the time of the trade, was very clearly blocked by Kris Bryant at third base. Chicago used him to pick up a rental backup catcher and a left-handed reliever who was signed through 2018. The gamble didn't quite pay off in the short term -- the Cubs were bounced by the Dodgers in the NLCS -- and it hasn't looked any better in the long term. Despite undergoing a midsummer slump recently, Candelario has been an above-average bat at the hot corner, and he should figure solidly in Detroit's rebuild plans. Paredes, ranked as the Tigers' No. 8 prospect, showed impressive pop for a shortstop with 12 homers for Class A Advanced Lakeland and is a 19-year-old at Double-A. It's not the Justin Verlander return by any means -- which isn't included in this column because it occurred after the non-waiver trade deadline -- but Detroit already seems to have done quite well here. Eduardo Nunez (Red Sox) for Shaun Anderson and Gregory Santos (Giants): This seemed like a small trade at the time but could look like more the farther we get from it. Nunez was meant to provide Boston with cover on the infield, and he's since become the team's starting second baseman with Dustin Pedroia still on the shelf. Anderson, a former college reliever turned Minor League starter, has become one of the most solid prospects in the San Francisco system, highlighted by the fact that he represented the organization at the Futures Game earlier this month. He's at Triple-A Sacramento and, with three above-average pitches, very much looks the part of a back-end Major League starter. Santos was in the Dominican Summer League at the time of the deal but could eventually tip the scales on this trade in the Giants' favor. The 18-year-old right-hander has posted a 3.31 ERA with 31 strikeouts and 10 walks in 32 2/3 innings at Class A Short Season Salem-Keizer in his stateside debut, with plenty of room to grow. Yu Darvish (Dodgers) for Willie Calhoun, A.J. Alexy, Brendon Davis (Rangers): This set the bar for the Manny Machado market this time around. At the time of the deal, Darvish had just a few months before he hit free agency but would also pretty clearly become a No. 2 or 3 starter for any contending club. The Dodgers used him for four postseason starts, two in the World Series. Still, he was a rental and moved on to the Cubs in the offseason. For those three months of Darvish's services, Los Angeles gave up Calhoun, their No. 4 prospect and MLB.com's No. 69 overall prospect at the time, but held onto bigger names like Walker Buehler and Alex Verdugo. That still looks like it was a good plan. Calhoun moved from second base to left field but remains a question mark on defense. The bat plays, however, and he recently earned a bump back to the Majors after hitting .332/.379/.471 with a 121 wRC+ since May 1. He's still as dominant at the plate as he was this time a year ago, especially in the power department, but Texas has a better chance to find a spot for him in the lineup than an NL club like Los Angeles would have. Meanwhile, with Darvish gone, the Dodgers are probably happy they still have Buehler and Verdugo. J.D. Martinez (D-backs) for Dawel Lugo, Sergio Alcantara, Jose King (Tigers): Looking back on this one might drive a few Tigers fans batty. Like Darvish, Martinez was going to be a free agent at the end of the season. He also had limited defensive value, which was especially a factor with him going to an NL club. But with hindsight fully in our favor, it's tough to imagine one of the game's top-five hitters being dealt for no Top 100 Prospects whatsoever. Offensively, Martinez only got better after the move to Arizona, hitting 29 homers in 62 games before signing with the Red Sox this offseason. Lugo -- an infielder who makes a ton of contact and could tap into some good power as he matures -- was meant to be the centerpiece of the deal. But as a 23-year-old at Triple-A, he's produced just a .264/.276/.349 line for Toledo. Alcantara is more known for his defense on the dirt but is hitting .290 with a .702 OPS at Double-A Erie. King, 19, moved back to the Gulf Coast League after a rough start with Class A Short Season Connecticut. If Detroit knew how good Martinez would be down the stretch, it clearly would have demanded more from Arizona. Even a year ago, though, it looked like the Tigers let the D-backs off easy for a big-time power bat, and it especially looks that way this season. Jaime Garcia (Yankees) for Huascar Ynoa (Braves), Zack Littell (Twins), Dietrich Enns (Twins): Remember when the Twins acquired Jaime Garcia from the Braves on July 24, thought they weren't going to compete and then flipped him to the Yankees six days later? It's still tough to see who did better in this trade. Littell is the only one of the three prospects to have seen Major League time, but it hasn't been great as he's allowed seven earned runs on seven hits and six walks in 3 1/3 innings. His 3.63 ERA and 1.31 WHIP at Triple-A Rochester are solid but uninspiring. Enns is upper-Minors rotation filler at this point. Ynoa is much further away. The 20-year-old right-hander was just promoted to Class A Advanced Florida after posting a 3.63 ERA with 100 strikeouts in 91 2/3 innings at Class A Rome. With a plus fastball and projectable 6-foot-3 frame, he's got more to dream on than Littell does, but control issues, lack of a plus off-speed pitch and his distance from The Show make it difficult to claim him the better get than Minnesota's haul. Check back in another year. Tony Watson (Dodgers) for Oneil Cruz and Angel German (Pirates): There's a decent chance most baseball fans outside California have forgotten about this trade already. Watson played a serviceable role as a lefty out of the Los Angeles bullpen down the stretch, even making 11 postseason appearances, but chose to sign as a free agent with rival San Francisco in February. In exchange for a couple months of Watson's services, Pittsburgh picked up a player that has become one of the Minors' most fascinating prospects in Cruz. The 19-year-old measures in at 6-foot-6 yet has played each of his 85 games in the field with Class A West Virginia this season at shortstop. He's shown all-around offensive ability for his age, hitting .289/.346/.484 with 37 extra-base hits and 10 steals, though it's worth noting he is repeating the level. Still, the Bucs got one of their best current prospects for a reliever who was going to go elsewhere in the offseason.